This is the Carlisle links tire 18x8.50x8 mounted on a 8" white steel wheel. Used on EZGO and Club Car. The Carlisle Links Golf Cart Tire is the gold standard for golf cart tires, it is designed to have good traction without damaging the turf. 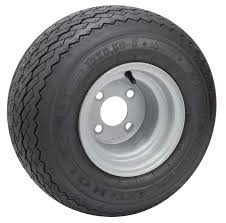 The Carlisle Links Golf Cart Tire is built tough and has a excellent long lasting tread compound. 18X8.50X8 Kenda Hole N 1 tire on a grey steel wheel.